I am 99.9% sure, January is the hardest month of the year for everyone. And if it isn't, TELL ME YOUR SECRETS NOW! I have been doing a bit of online window shopping, and found some clothes and homeware bits I really want! I've already decided I'm heading out shopping right after payday! 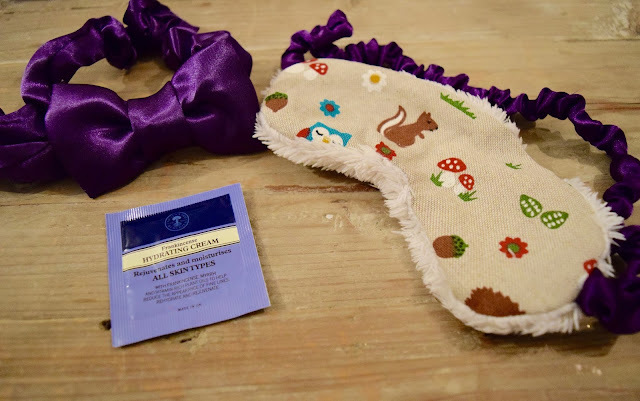 I saw these products in Zoella's 2015 favourites and she said how much they improved her skin, I'm dying to try their Sensitive Skin Range but they're slightly on the pricier side so this will have to wait! 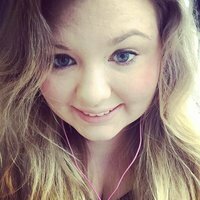 Blog Layout: I'm really not feeling my blog layout anymore, at the beginning of next month I'll have a brand new blog layout, and hopefully be launching a new giveaway for you all! Infrution Bottle: I've loved the look of Infrution bottles for a while, it's a great way to drink more water with the health benefits of fruit! The Whole Of Lush: Need I say more? 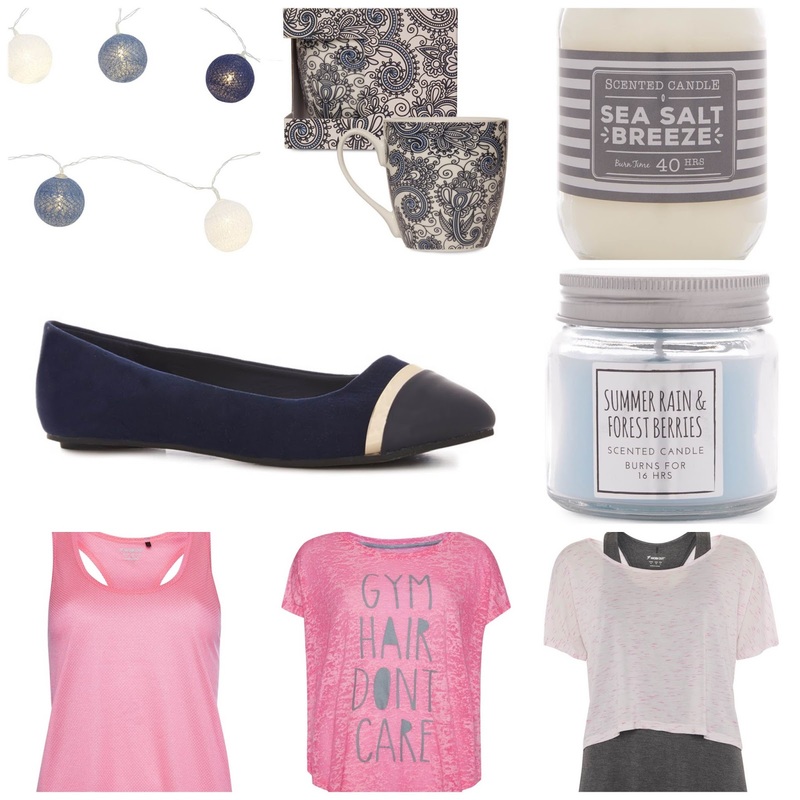 What is on your Payday wish list? One of my favourite snacks at the moment is Pistachios. The lovely people over at Wonderful Pistachios* sent me some of their range for me to try. I tried a few of their flavours back in December but there were some I didn't get to try. 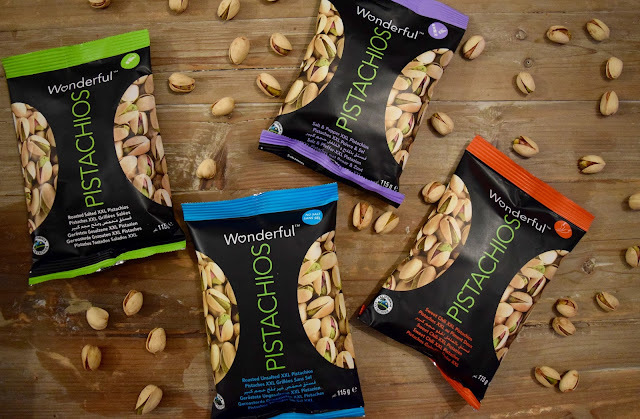 There are health benefits of eating pistachios, as if I needed more of an excuse to eat them. Pistachios lead to a healthy heart, help with weight management, eliminates skin dryness, has dietary fibre and many more. 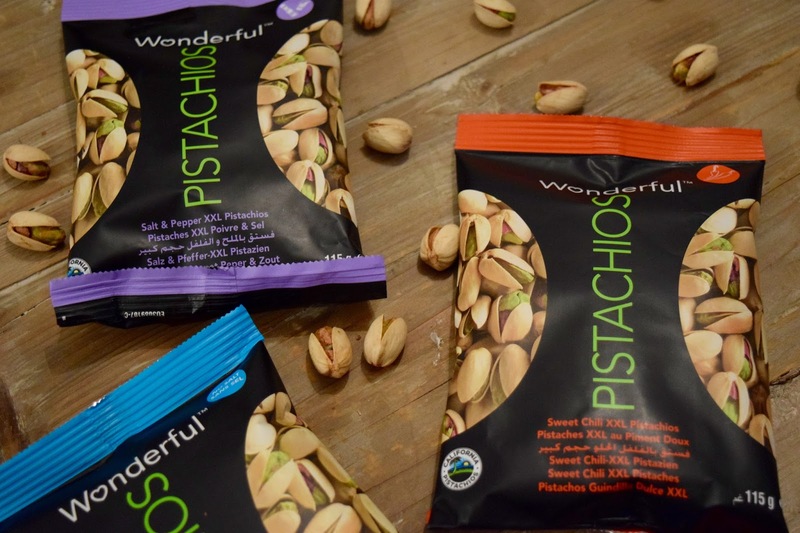 Wonderful Pistachios do 4 different flavours: Roasted and Salted, Salt and Pepper, Sweet Chilli and Roasted No Salt. My favourite has to be Sweet Chilli! Both roasted flavours are great as a snack or to add to salads or meals. If you're looking for a bit of a different flavour then I would strongly recommend the Salt & Pepper or Sweet Chilli flavour! However, I will warn you, they are so moreish. I am so bad for snacking, especially at work, we are constantly picking at whatever food we've got lying around. 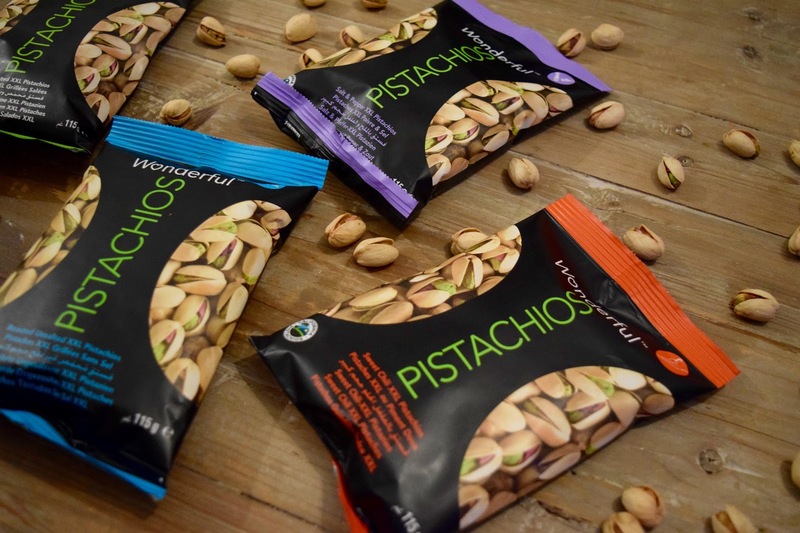 So these pistachios are perfect to have as a mid-morning/afternoon snack, a little messy, but totally does the job. They come in ideal sized packets at 115g which can be popped in your bag. You can buy your own from Waitrose and Sainsbury's for £1.99/£2 respectively. Which flavour would you like to try? 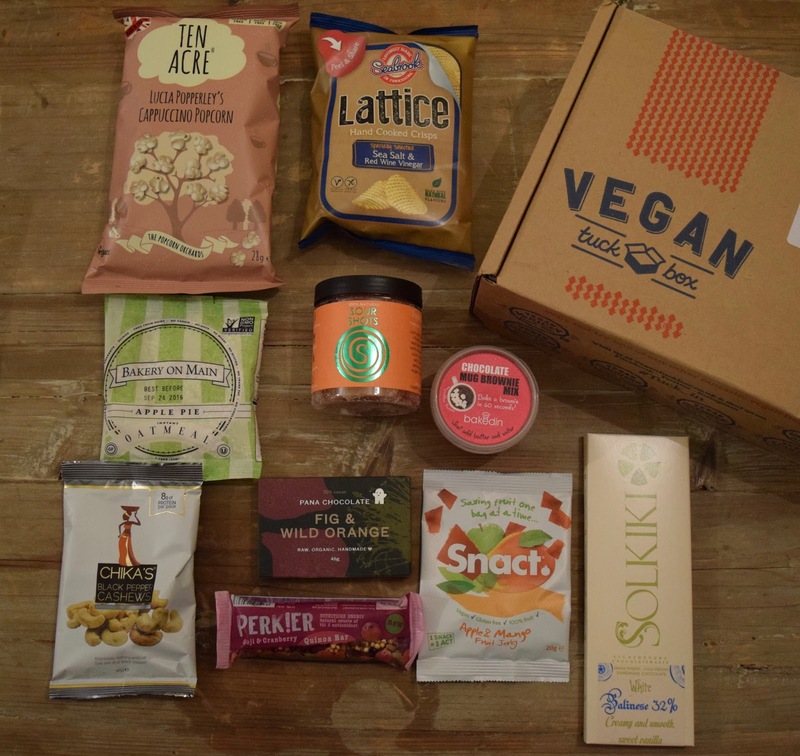 As part of Veganuary, Vegan Tuck Box* kindly sent me their Ultimate January Box. 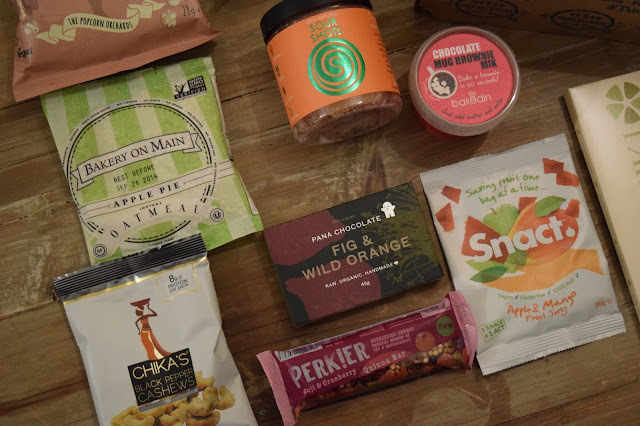 Vegan Tuck Box sent out 10 Vegan products a month that are products you wouldn't typically think are Vegan. I do love the whole concept of the box and think it is great that there is now a subscription box of Vegan food products. 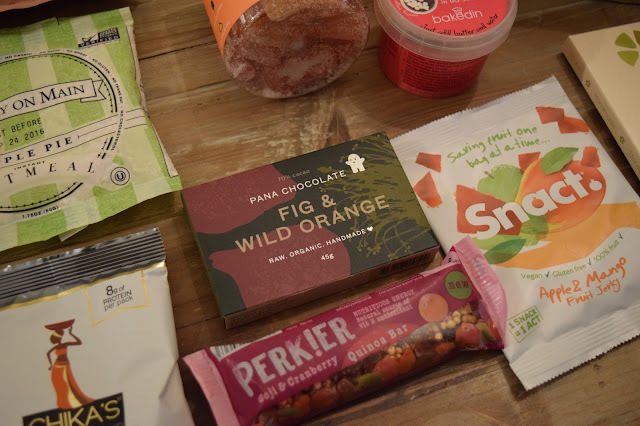 However, I did think the box would be predominantly healthier, fruit based products but this box had a lot of chocolate and crisps and sweets. I'm not eating these so I gave the unhealthier food away and took it in to work which I know they enjoyed! Also, 10p from each box sold goes to Vegan causes! 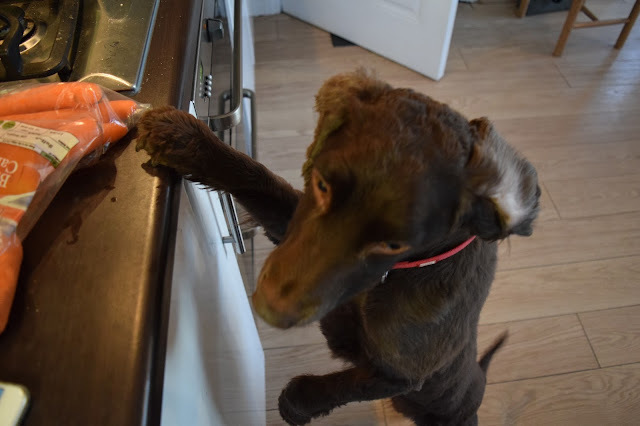 So you get yummy Vegan treats, and you're donating to charity! If you are Vegan and you are looking for products that are Vegan and you aren't too fussed about the calorie content of the products you will be getting then this box is perfect for you! If I wasn't eating healthily then I would definitely buy this box again! Don't forget to buy yours here! 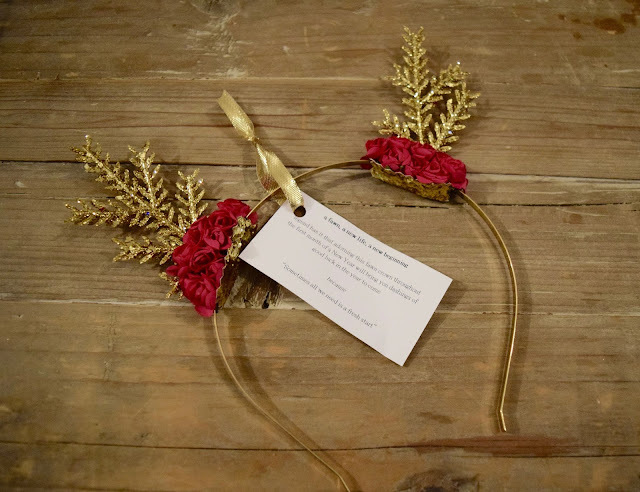 And you can get 20% off using the code 'BLOG20'. I am a massive fan of Itsu products. I love their seaweed things as a snack so whenI got to try their new Secret of Life Miso Box* I jumped at the chance. Itsu Grocery is where you can get all your favourite Itsu products from. They do 6 different flavours of noodle pots, basically a much tastier, healthier, posh pot noodle. 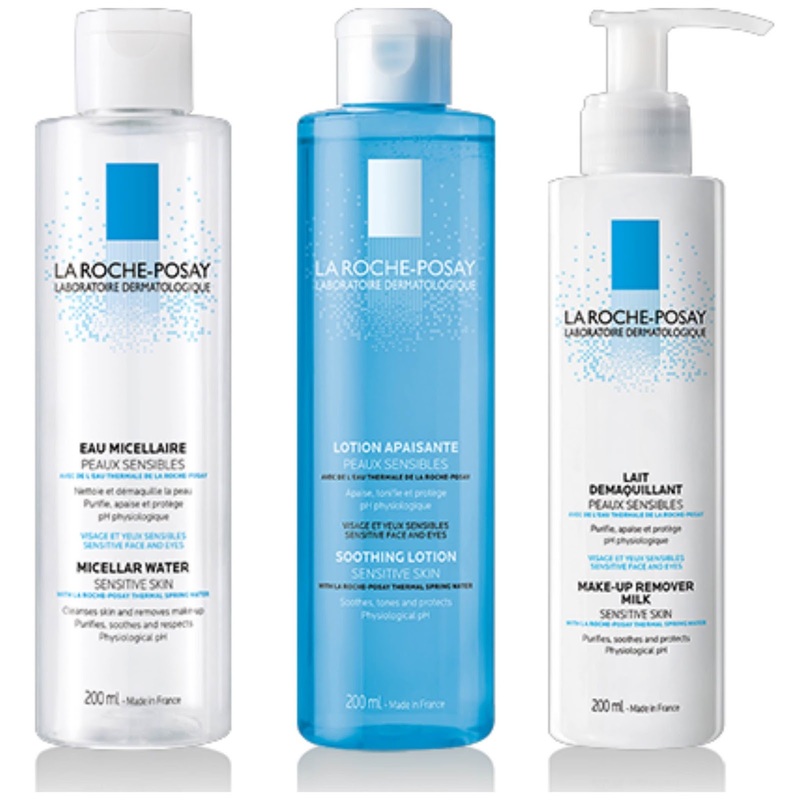 This is definitely on my list of products to try. You can also get their seaweed thins which come in 3 flavours, however wasabi is hands down my favourite flavour and they're only 22 calories per pack. 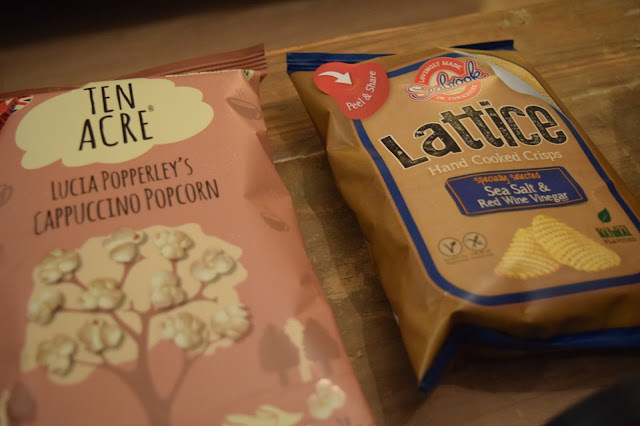 They also do a "healthy snacking" range with a whole load of snacks. I know I would love the mango and I'd also love to try their wasabi peas. 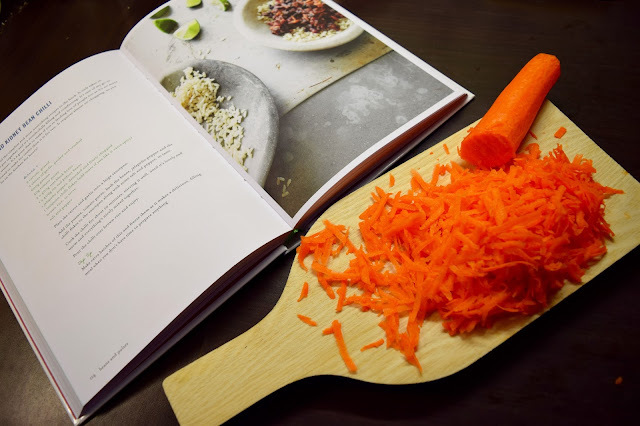 Itsu also do a small ingredients range which includes sauces and also hot su post sauce which is a hot sauce (basically in the name) which can be used on salads, sandwiches and any meal needing some spice. 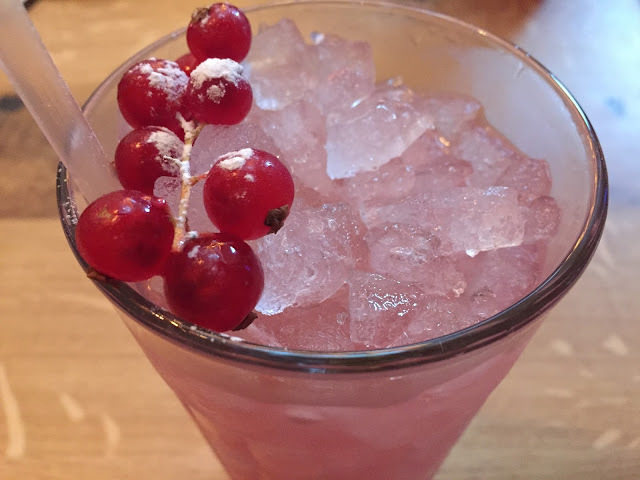 I think I'll be picking up one of these when I next go to an Itsu restaurant in London (or at least that's my excuse to go and eat loads of their delicious food). Their last product is of course miso soup. The Secret Of Life box is perfect at £7.20 and it's letter box shape which means you don't even have to be home to take the parcel. This is a massive positive for me, there's nothing worse than having to go to the post office for something that could fit through the letterbox! 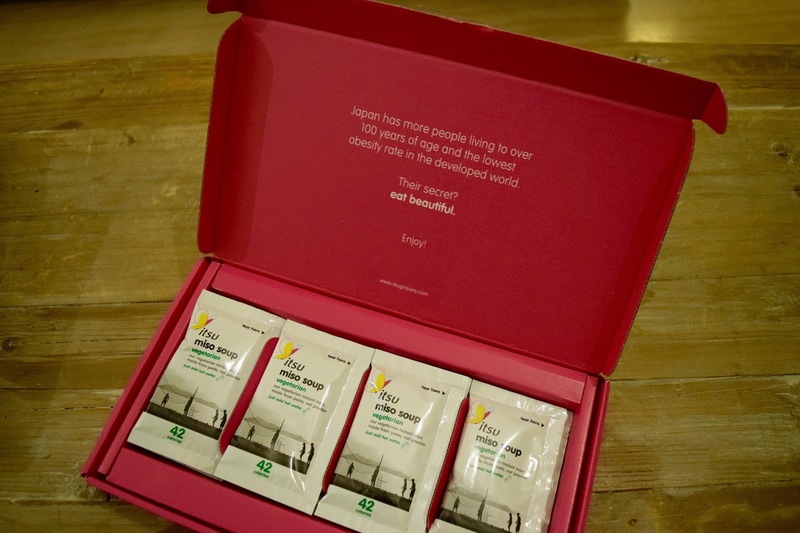 Inside the box is 12 sachets of Vegetarian Miso Soup. You can also get a Meat Version which I would love to try soon! Each of the sachets is in liquid form as opposed to powder form which you can often find in the supermarket. It is less than 44 calories per serving which makes it perfect for making swaps on a diet and when detoxing. Miso Soup is high in protein, vitamins and fibre and great for strengthening immunity and digestion, preventing osteoporosis and obesity and aiding memory. These sachets are perfect for lunches and still keep you full. It's definitely different from your regular soup and is an acquired taste so may not be for everyone! Once I finish this box, I'm definitely going to be ordering another one! Do you like Miso Soup? 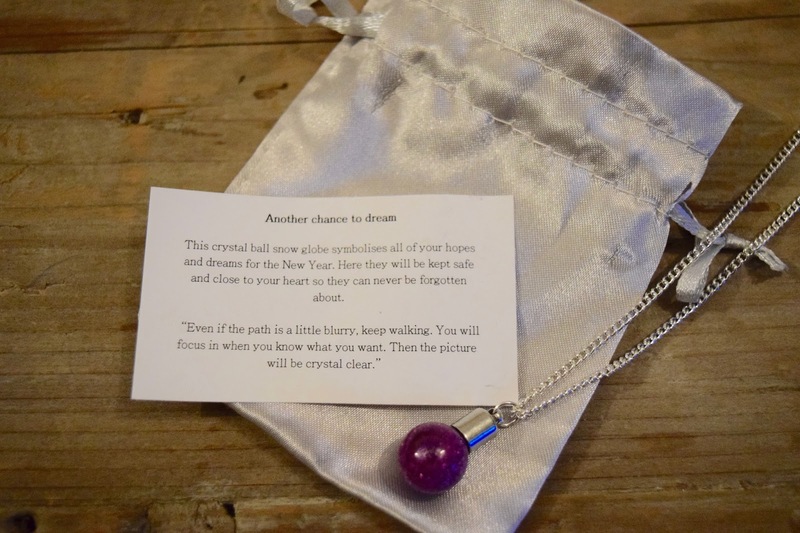 Will you be purchasing a Secret Of Life Box? For most people January is for detoxing and that health kick we all need, especially after overindulging at Christmas! 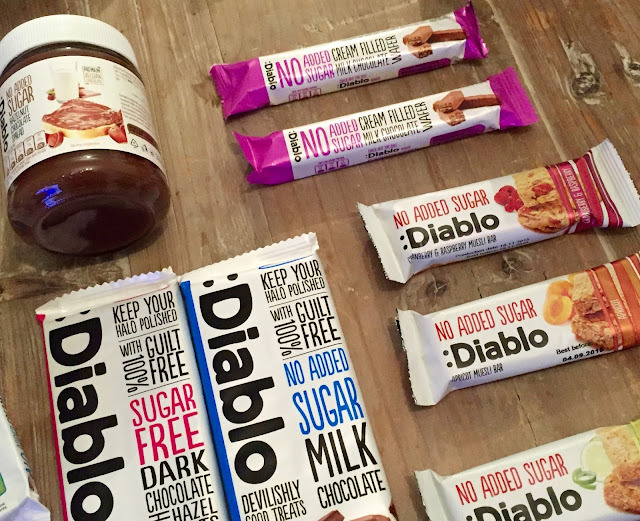 This is why :Diablo Sugarfree* is so perfect for this time of year as they're products are Sugar Free or have no added sugar. 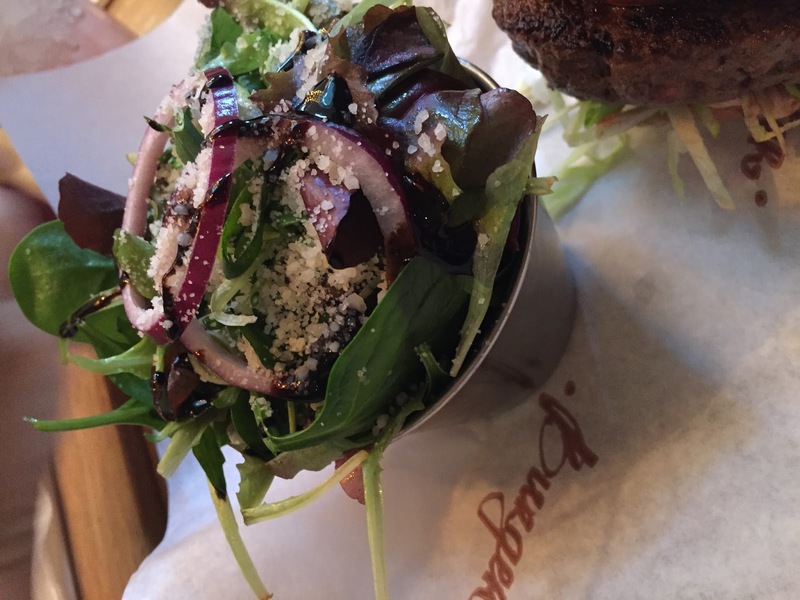 So you can still have that little bit of indulgence if you have the craving for it. They do a great selection of products, typically chocolate based but who am I to complain about that? 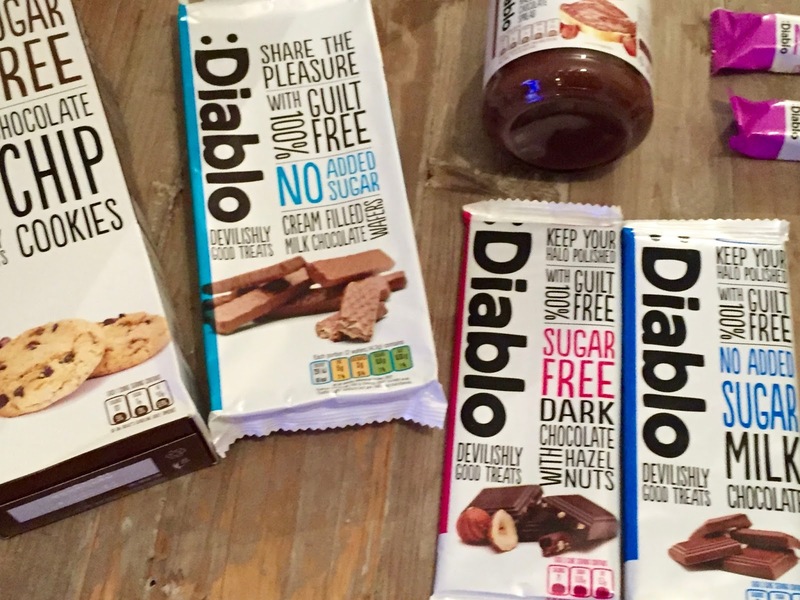 Now despite these products being sugar free and having no added sugar, they aren't healthy which I was a bit disappointed about. For example, one of the cookies is over 100 calories, I mean that is quite a lot for what it's supposed to be. Wafers: These Chocolate Wafers are so moreish and I could literally devour one right now! They have no added sugar but you really can't tell as they are still sweet from the chocolate. They are however 150 calories per 30g portion which I think is way too much to eat them all the time.. they are perfect as a treat but not as a regular snack! If it's to cut back on sugar you are looking for then it's perfect as there is only 1.9g. Cookies: Now when I read the label on these I was a bit shocked as it said 100 calories per cookie! That's quite a lot for one cookie. However these are sugar free so if you want to cut out sugar from your diet but still want to indulge then these are perfect. The texture is great and the taste is still there despite having no sugar as I always expected the taste to really lack. This is a winner for me. Muesli Bars: I got to try 3 different flavours of these: Apricot, Lime and Cranberry & Raspberry. I love all the flavours and with only 106 calories each, I was quite happy with this and would definitely buy them again based on how they taste and they are lower in calories compared to other cereal bars. These muesli bars have no added sugar so still have 2.7g in them but I can imagine this is from the fruits and syrup in the bar. So again another product I would repurchase. Chocolate Bars: I also got to try two different chocolate bars - the no added sugar milk chocolate and the sugar free dark chocolate with hazelnuts. The milk chocolate honestly tasted like normal chocolate so you can guess that it didn't last long. Each portion was 70 calories, compared to your Dairy Milk which is 120 calories for even half the bar. 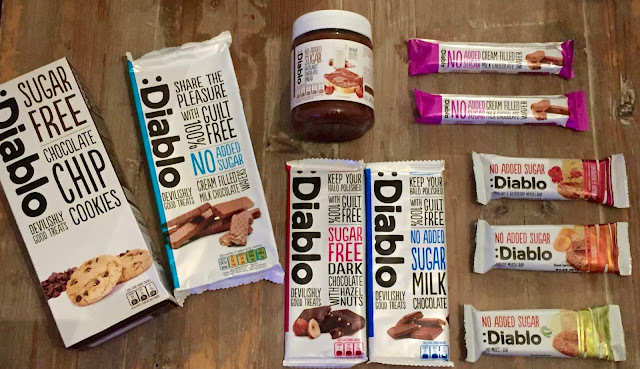 Plus in the :Diablo Chocolate bar there is 1.2g of sugar per portion compared to more than 4g of sugar in one square of Dairy Milk which is incredible. I know which one I would choose! Hazelnut Chocolate Spread: I don't know if any of you have ever looked at a Nutella label but I would suggest you don't. Sure it tastes great but it is pretty much pure sugar. However, in :Diablo No Added Sugar Hazelnut Chocolate Spread per portion there are 74 calories and 1.3g sugar. This is nothing on Nutella and it tastes identical to Nutella, you really can't go wrong! There are several other products I didn't get to try such as their bags of sweets which look so good! I think these products are a great concept and it goes to show you don't have to lose out on taste by cutting down on sugar! Plus the products are totally affordable which you can find here. Would you try these sugar free products? As part of Veganuary I've been in search for some exciting new recipes. 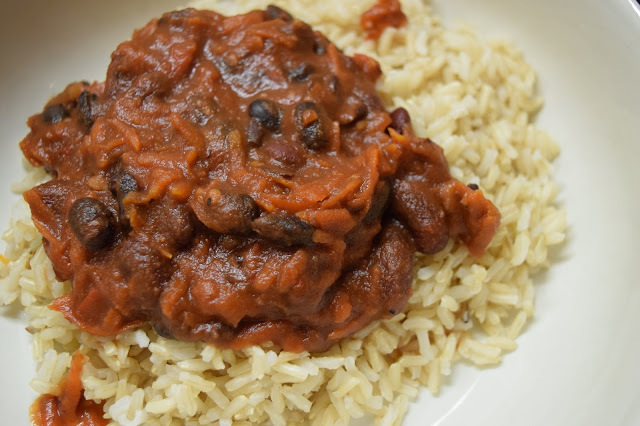 I started flicking through the Deliciously Ella cook book and came across her Black and Kidney Bean Chilli so I thought I would have a go at it myself but of course add my own little twist on it! 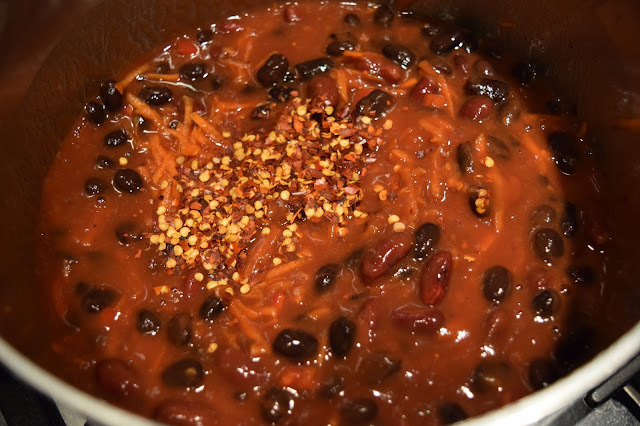 Cook the chilli for 10 minutes or add some water and leave it to simmer for a little while to let the flavours fuse some more. Make sure you stir it well or it sticks! 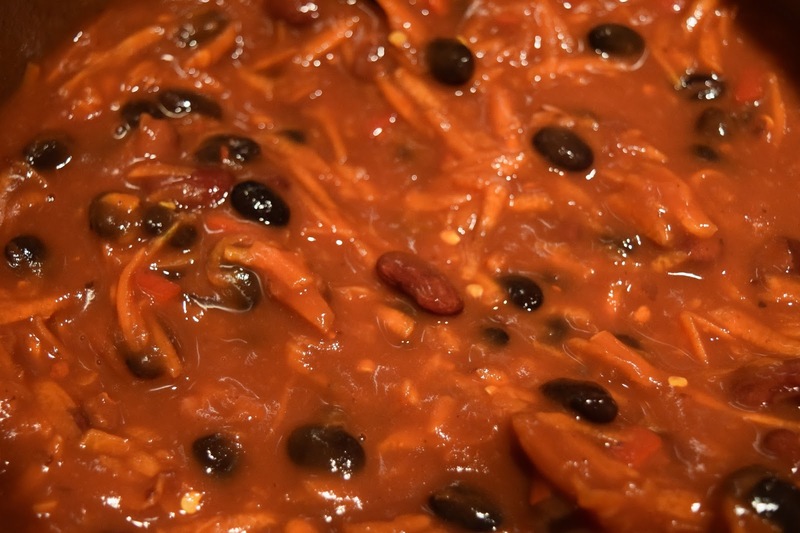 This recipe is for quite a spicy chilli so make sure you adjust the hotness to your taste! I've been craving spicy food since going Vegan as some can be quite bland! It is so good, I wish I could have seconds right now and I'll be doing a blog post on how to use leftovers very soon! 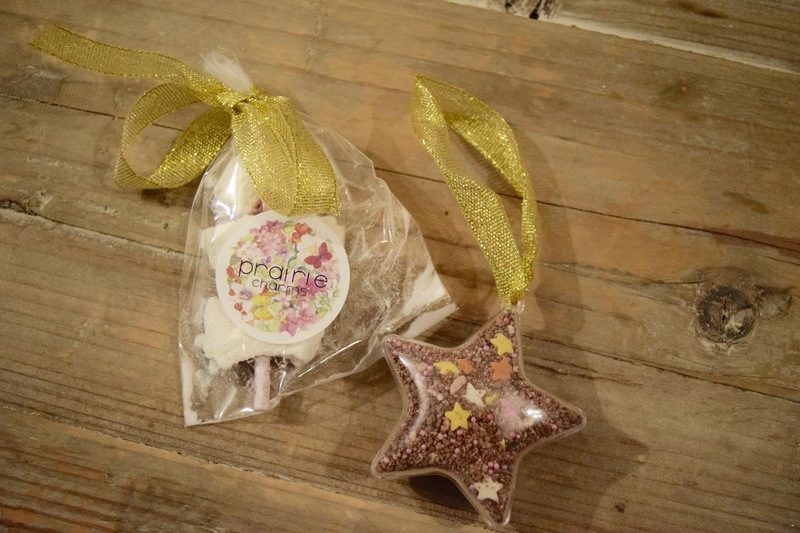 Yes, that's right, Prairie Charms are back with their latest edition of Prairie Pizzazz. This time with their Christmas box. They certainly did not disappoint with all their teams involved, it was literally everything you need for Christmas in a box. 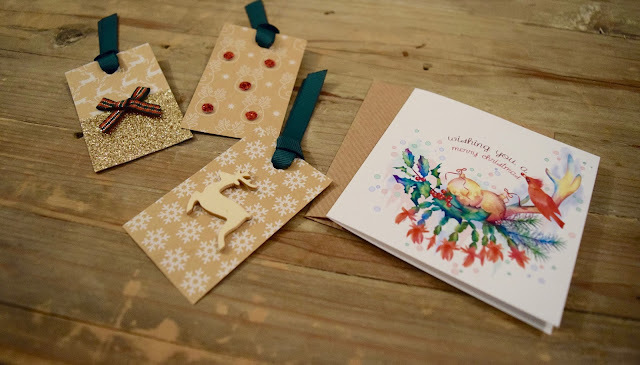 Everything from Christmas cards and tags to a Christmas themed necklace to a pamper kit. I think the snow globe necklace is so pretty and I love the colour of it! 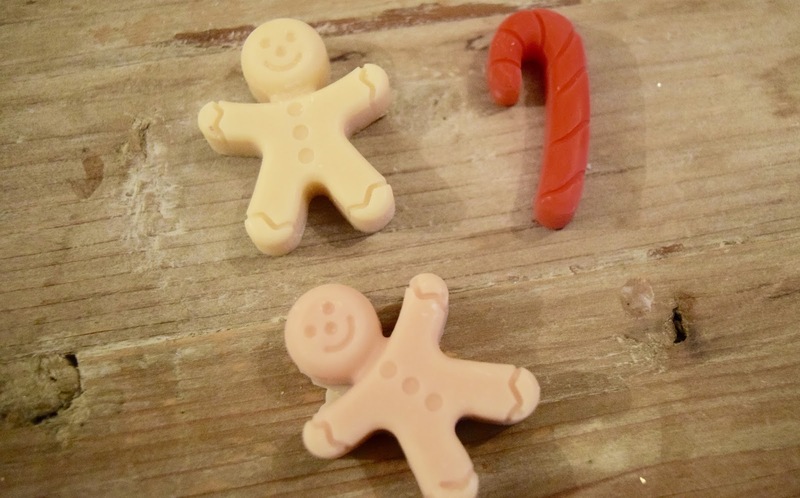 The wax melts are so Christmassy that I might save them for this Christmas but I'm slightly too impatient for that. Does anyone else find that wax melts lose their scent really quickly or is that just me? I also love the snowy mountain hot chocolate kit and this would have been perfect for Christmas Eve! In my opinion this is a great Christmas box that would have been perfect should it have arrived before Christmas but unfortunately mine arrived afterwards. However, I have been enjoying it since! I can't wait to see what this year brings for Prairie Charms. 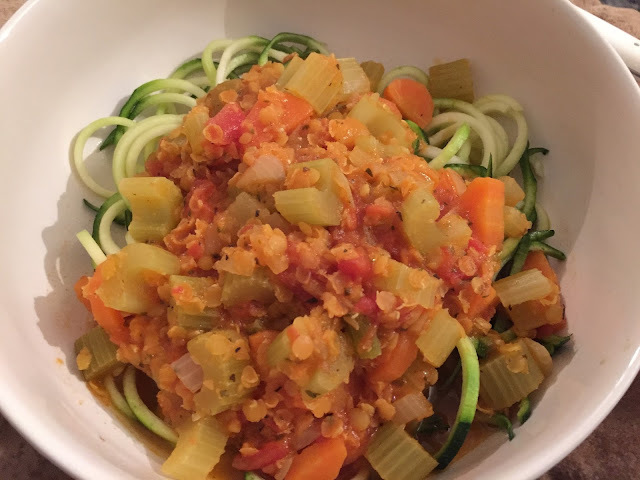 At the beginning of the year, I share with you that I was taking part in Veganuary so I've been experimenting with a few recipes and that's when I came up with Lentil Bolognese. This recipe serves 5/6 people. 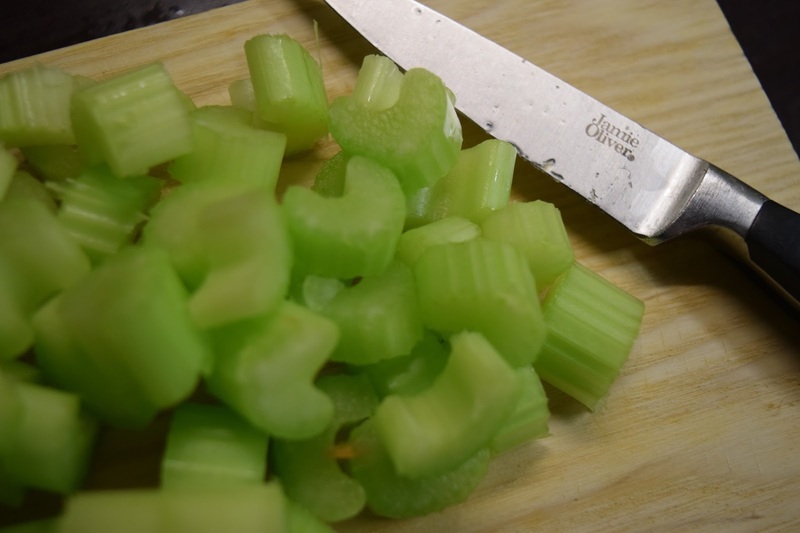 Place all the chopped vegetables and garlic in a large sauce pan with some oil and soften for about 15 minutes. Add in the tin of tomatoes, stock and lentils. Give it a good stir to evenly mix everything. Then add in the seasoning and herbs and stir some more so it doesn't stick. Simmer for 40 minutes. Check it every so often and stir. 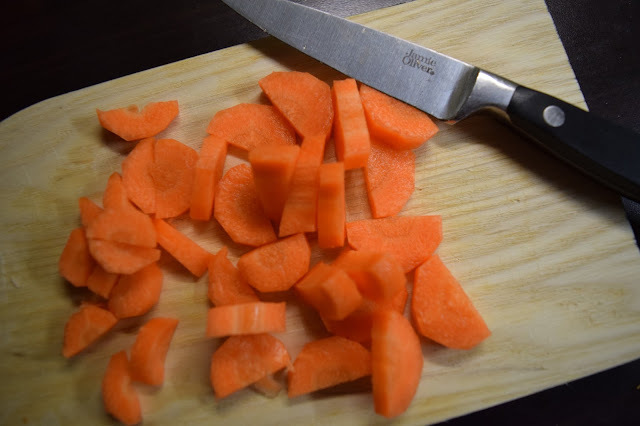 Taste for seasoning and add more if it needs it. 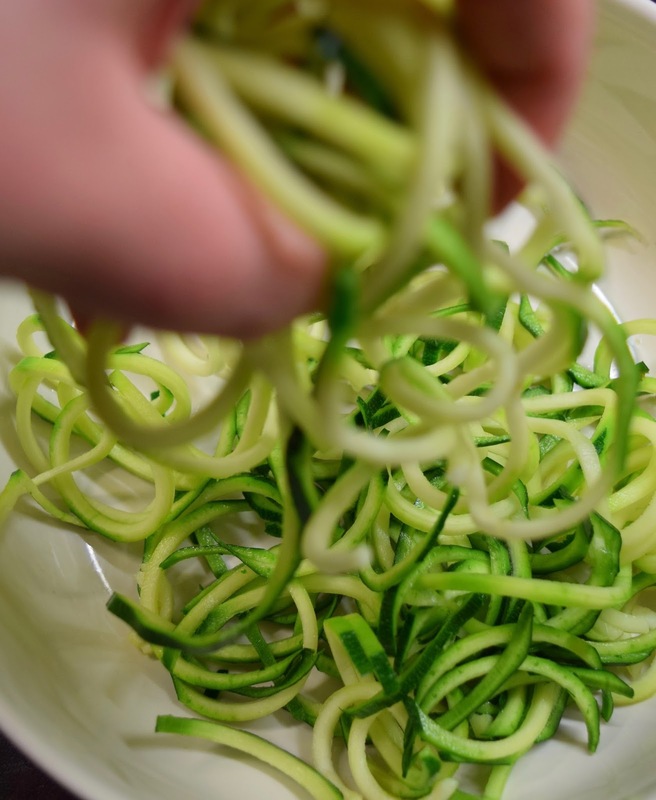 Spiralize a few courgettes and divide between the bowls. 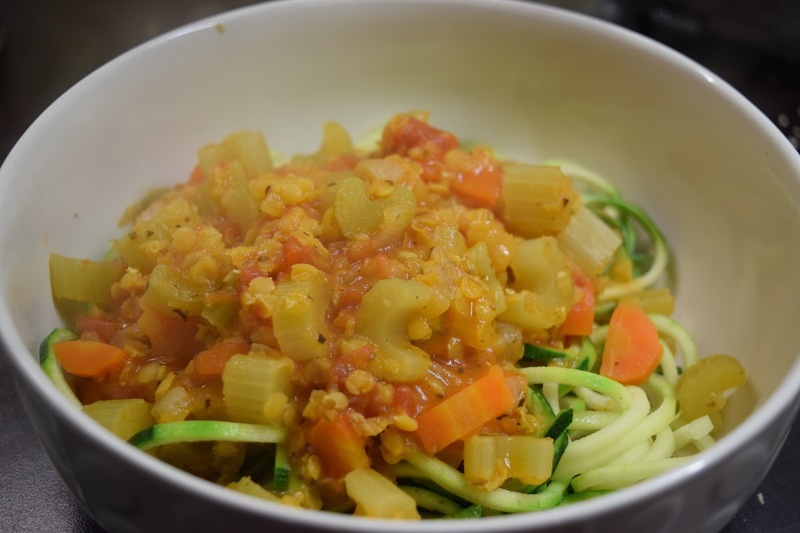 Top with several spoons of Lentil Bolognese on top which will heat through the courgette. Enjoy! It's so easy to make which is great! 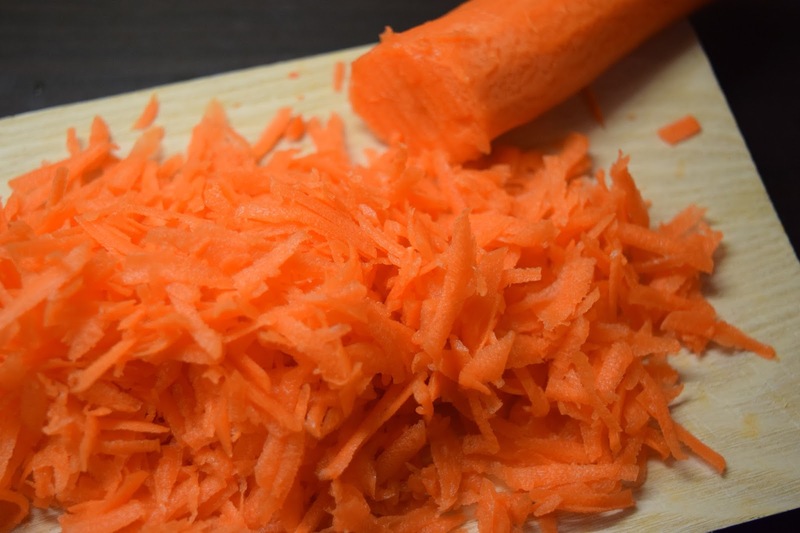 I want to spiralize carrot or butternut squash next as I think it will add a bit more flavour! What Vegan recipes should I try next? 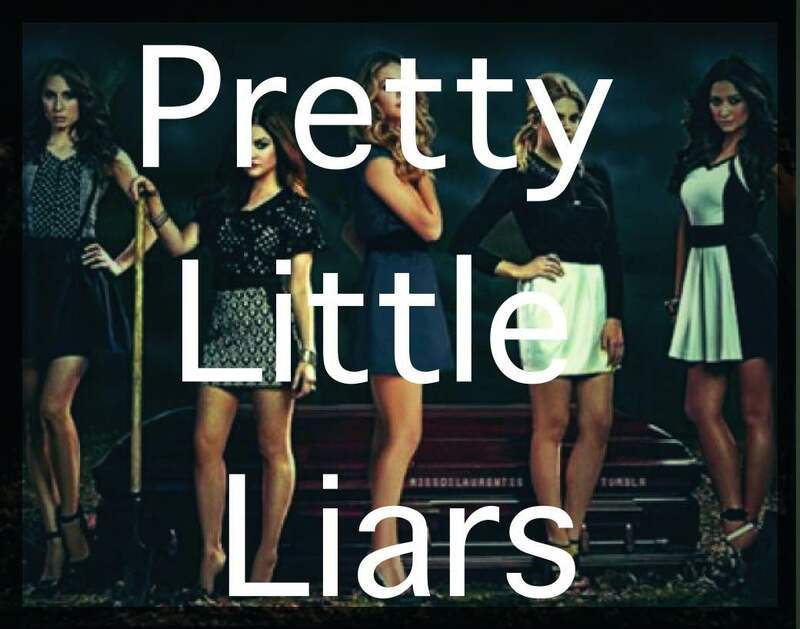 Now we all love PLL, and seriously where have you been if you haven't watched it? And it is F I N A L L Y back, today! I'm fortunate enough to have had the day off, so I watched it as soon as I could. So we finally found out who A is, so what next? Can it be home time yet? I need to watch PLL. What's going to happen this week? It's #5YearsForward, so what happens now? The liars thought they were safe, but clearly not. What's really A's story? Why are they back to get the liars? What the hell happened to Hanna and Caleb? Their relationship is just GOALS. I can't wait to see what happens in the court hearing. Wil we ever find out about Charlotte? Who is the new A?! Charles or Charlotte? I mean someone give me some answers please! Why did Mr DiLaurentis have it in for Charles? Why did he hate him so much? First episode in and A isn't back, I don't get it. I need answers damn it! Also I totally did a post last year about what I thought about PLL then, check it out here. I never knew how many teas you could get until I started blogging. I've recently found T Plus* teas which are no ordinary tea and while they taste amazing, always a bonus!, they actually have health benefits too and in the cold January month, they are really coming in handy. First of all I tried t+ multivitamin which is lemon and peach. From my last post on T-Sticks, peach was one of my favourite flavours so already I was excited about this one. 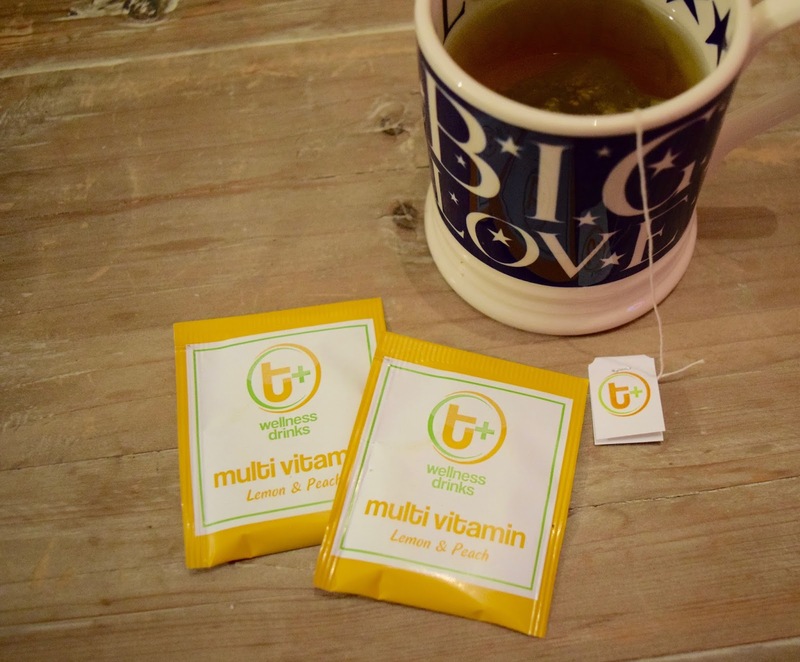 It is a natural blend of green tea, herbs, fruit and vitamins and packed full of goodness. It also has rosemary, dried apricot and pumpkin in which at first I found a little odd but the flavour is so subtle which means you can't taste it too much. Plus it adds to the health benefits so that's ok! My favourite time to drink this is around 11am if I'm at work as a mid morning pick up, so I know I've got my vitamins for the day! The second tea I got to try was t+ boost which is raspberry and pomegranate - two of my favourite fruits! 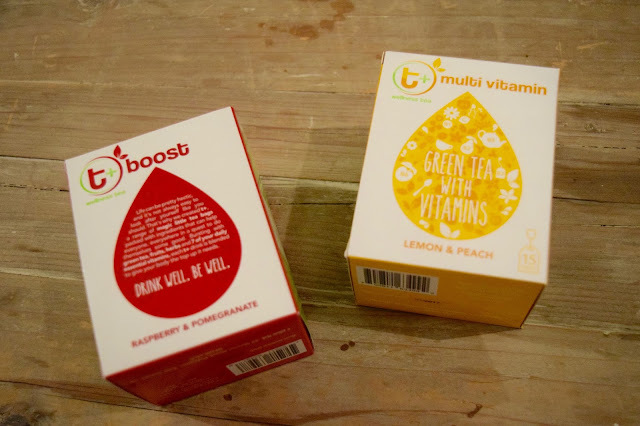 As with t+ multi vitamins, t+ boost is a natural blend of green tea, herbs, fruit and vitamins. This tea has yerba mate, ginseng and rose hip in it which contributes to the boost of the tea instead of the flavour. I love to have this tea first thing in the morning or in the afternoon before my run that evening. It has energy releasing B vitamins which are absolutely perfect for that boost! 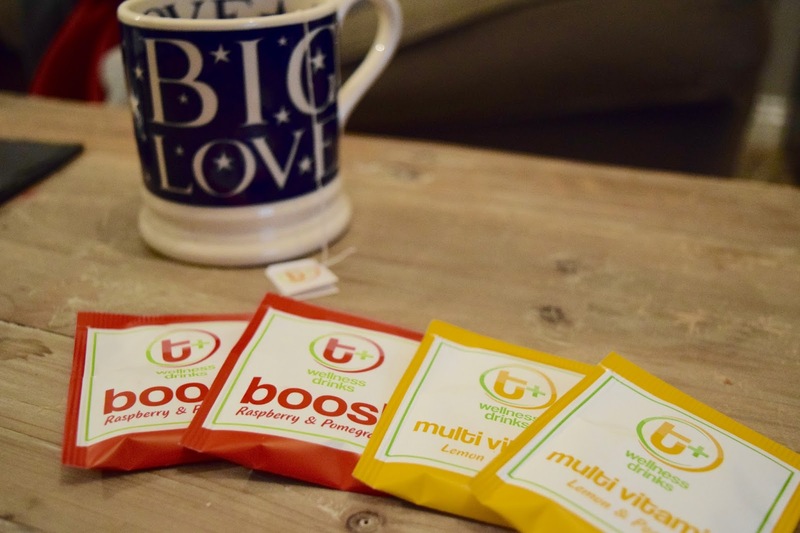 I really don't like having more than one cup of coffee a day unless it is really needed so I love drinking this tea to avoid a mid afternoon slump! 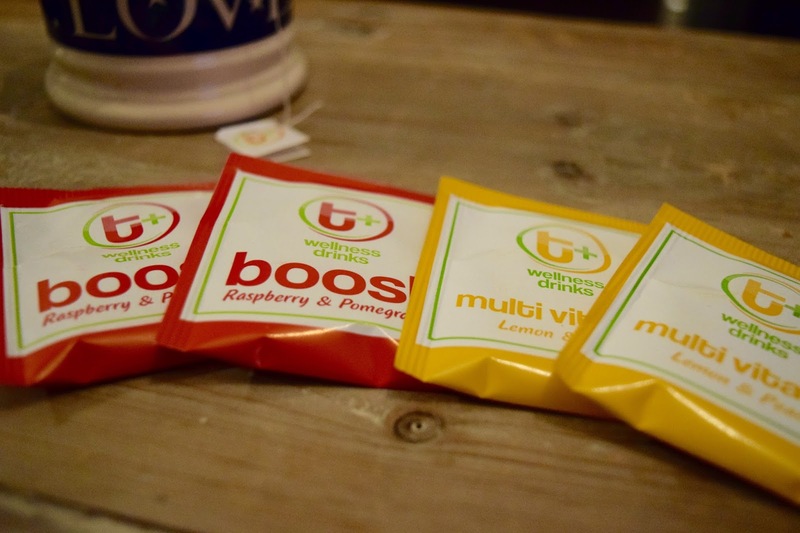 I love the flavour and benefits of these teas and they're even better because they're individually wrapped, the way all tea should come! You can get your own box for £2.76 here and be sure to check out their twitter and stunning Instagram! 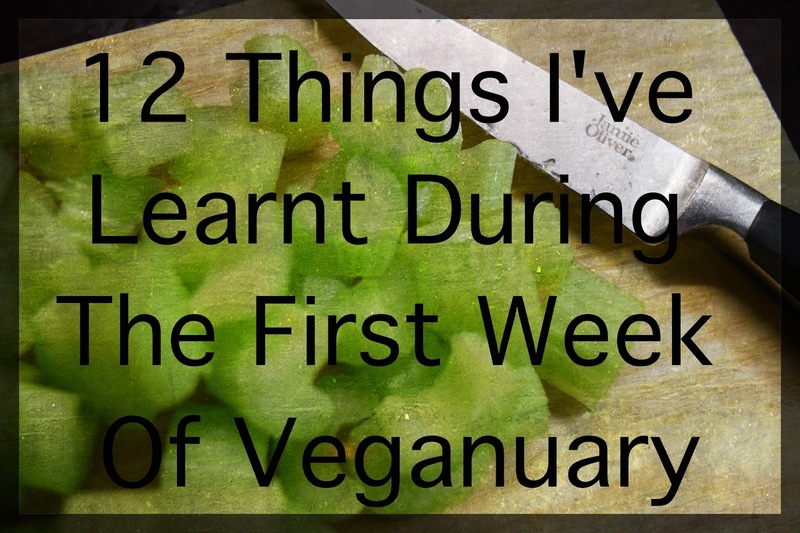 I'm not going to lie to you, it's been blooming hard during the first week of Veganuary. The few days before I started, we were thinking of what I could actually eat, we came up with a few ideas and have gone on from there. It makes it more difficult as the rest of my family will be eating meat and pasta and basically everything I can't eat and I can't force them to eat Vegan with me! So it's been tough finding the right balance between eating what I can with them and making my own meals. People actually do this all the time...how?! At the end of the day, this isn't as bad as I had imagined and I've even thought about having more vegetarian meals and cutting back on meat! 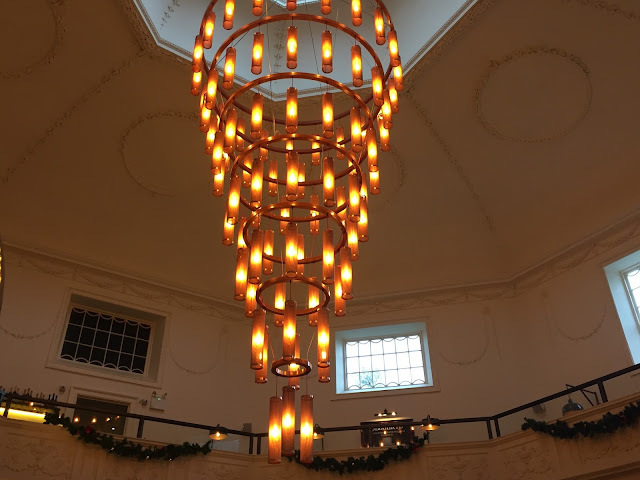 Before Christmas, I went on a little day trip to Bath with my Mum and Sister and after popping into a few smaller independent shops we headed to find somewhere for lunch. I didn't want to go just anywhere, I wanted to find somewhere we wouldn't normally go to. 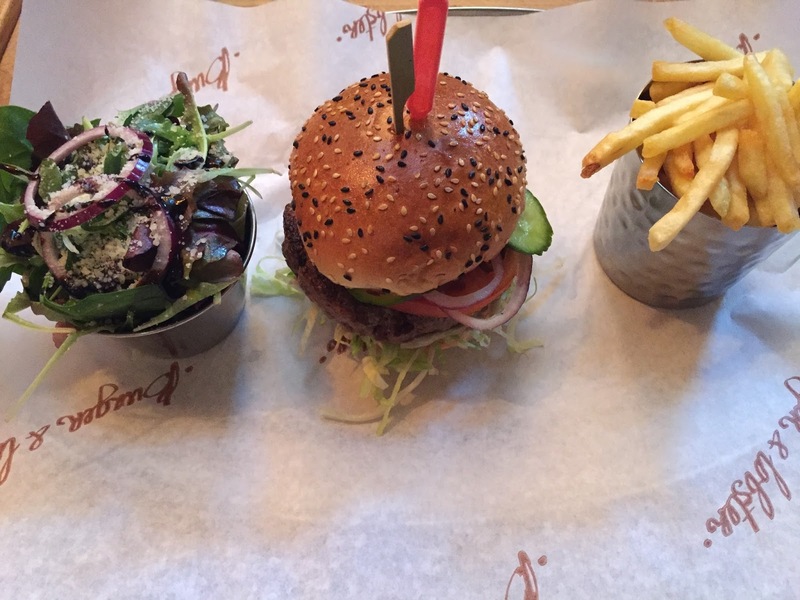 Which is lucky we came across Burger and Lobster. It was quiet in there but the atmosphere was great! The decorations were stunning and there was a massive chandelier hanging above the bar in the centre of the room. They only have 3 options on the menu: Burger, Lobster (duh!) and half and half, so you get half a lobster and half a burger! Way to keep it simple eh! However, they do have a massive drinks menu with some delicious cocktails on there! 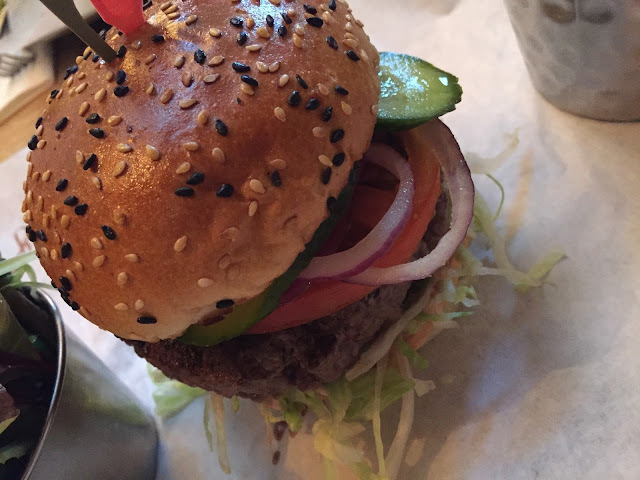 I decided on the burger and had it medium rare (I mean is there any other way?) and it came served with the best fries I've ever had and a small salad too. 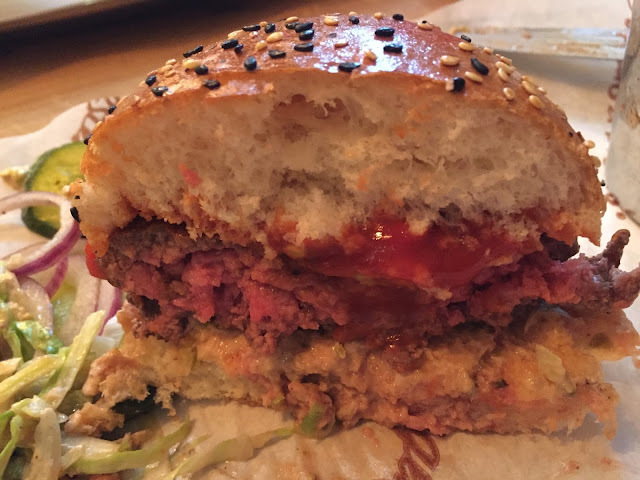 The burger was literally cooked to perfection and being medium rare, it was pretty much still alive...It was one of the best burgers I've ever had. 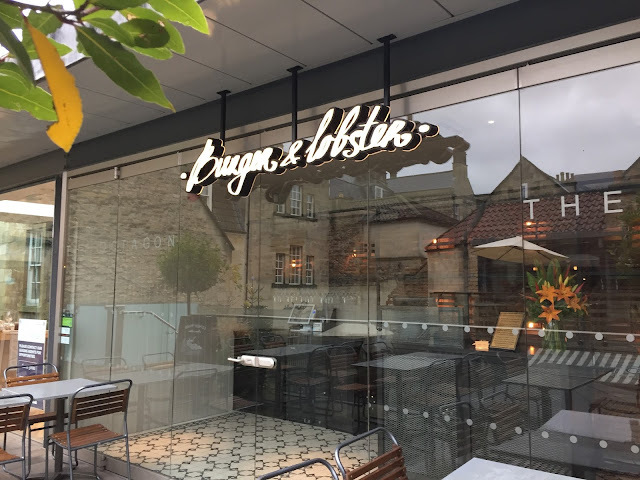 The staff were so lovely which is always a massive thing for me and I would definitely go back there to try more of the menu, and the cocktails of course, but I would have half a burger and half a lobster next time!